They Work With More Than 4 GB of RAM - from my perspective, this is a very important benefit. RAM memory is very cheap nowadays, and many people can afford installing 4GB or more. More memory translates into better performance when running games and applications that process large amounts of data, or when doing video editing and other tasks which use a lot of memory. Increased Performance for 64-bit Programs - programs which are designed to take advantage of a 64-bit operating system will run faster than their 32-bit counterparts. Enhanced Security Features - you will benefit from features such as hardware-backed Data Execution Protection (DEP) and Kernel Patch Protection. These features will help prevent security attacks that might succeed on 32-bit versions of Windows Vista which use methods known as buffer overflow and kernel patching. If all these terms sound like gibberish to you, then you should remember only the fact that 64-bit versions are more secure than the 32-bit versions. You Cannot Install 16-bit Applications - 16-bit applications were developed when Windows 3.11 and Windows 95 were on the market. All software companies are now developing only 32-bit or 64-bit applications. Therefore this is not exactly a big loss unless you want to install & use some application or game developed 10 years ago. You Cannot Install 32-bit Drivers - 32-bit device drivers are not supported. You must use native 64-bit drivers. This can be a problem if you are using old hardware or devices from producers which do not offer 64-bit support. They are not that many but you still need to be careful, especially with older devices. Double check if there are 64-bit drivers available for all your hardware before installing Windows Vista 64-bit. Driver Signing is Mandatory - this basically means that all drivers must be digitally signed so that Windows knows that they are provided by a legitimate publisher. This is not necessarily a problem. Driver signing is used by Microsoft to evaluate the quality of drivers that are installed. A digitally signed driver is one that has been more thoroughly tested for Windows compatibility. Therefore this is not only a limitation but also a benefit. Device Drivers - make sure you double checked the availability of drivers for Windows Vista 64-bit. Don't forget to check also your external devices such as printers, scanners, etc. Incompatible Applications - there are some 32-bit applications that won't function on 64-bit. However, most of them will work. Personally I have encountered only one application which did not work on my 64-bit Windows Vista. Still, I've easily replaced it with an alternative offering the same functionality. Microsoft continuously updates the list of compatible hardware and software. If you want to know if the devices or software you are using work on Windows Vista 64-bit, check out the Windows Vista Compatibility Center. To filter the results more easily, you can also use it's Advanced Search feature. Another good destination for finding software that works on Windows Vista 64-bit is the Catalogue of 64-bit Software. 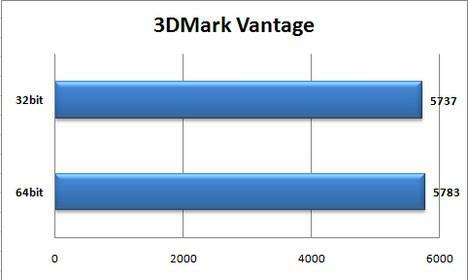 In order to evaluate the percentage of improvement generated by the migration to Windows Vista 64-bit, I installed 3DMark & PCMark Vantage Pro Editions on my PC. The hardware configuration details of my system can be found in the screenshot below. First, I ran both benchmarks twice on my Windows Vista 32-bit and recorded the best results. Afterwards I installed Windows Vista 64-bit and all the applications I use on a daily basis. Then I ran both benchmarks twice and recorded the best results. In order to evaluate the performance impact for 32-bit applications running on Windows Vista 64-bit, I also ran the 32-bit edition of PCMark Vantage on Windows Vista 64-bit and recorded the results. 3DMark Vantage is a benchmark measuring 3D gaming capabilities, based on comprehensive real-time 3D graphics and processor tests. As you can see from the screenshot below, the improvement obtained in Windows Vista 64-bit is only 0.8%. The GPU score, measuring the performance of the video card, was the same in both versions of Windows Vista. The CPU score, measuring the performance of my processor in games, increased from 4257 to 4364, which represents an improvement of 2.5%. From these results it seems that, unless they are optimized to run on 64-bit, you won't have a very noticeable performance improvement in games. Other benchmarks seem to confirm this. However, there are performance intensive games such as Crysis who benefit a lot from playing on 64-bit. 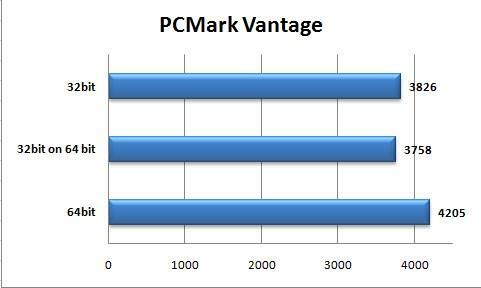 PCMark Vantage is a benchmark which measures performance across a variety of common tasks such as viewing and editing photos, video, music and other media, gaming, communications, productivity and security. This gives you a pretty good overview of the overall performance improvement in general computing tasks. As you can see from the screenshot below, the PCMark score was higher by 9.91% in Windows Vista 64-bit. This is a pretty good performance improvement. The areas where PCMark reported the biggest improvements are: image manipulation, data encryption and decryption, data compression and text editing. The results are as expected: the biggest benefits are seen when processing large amounts of data and when working with math intensive applications. In order to check if there is any performance decrease when running 32-bit applications on Windows Vista 64-bit I ran the 32-bit version of PCMark Vantage on it. As you can see from the chart above, the performance impact is very small. The decrease of performance was a neglijable 1.78%. Therefore you shouldn't worry about losing performance when running 32-bit applications. After two weeks of using Windows Vista Ultimate 64-bit, I must say I'm pretty happy with it. There weren't too many negatives about it, except the fact that I had to double check that I have drivers for it and replace an old Mustek scanner which had no 64-bit support. In terms of applications I had problems with RocketDock which does not support 64-bit versions of Windows and with the 64-bit version of 7-Zip which had some weird bugs. Fortunately, I quickly solved both problems by replacing RocketDock with ObjectDock and by installing the 32-bit version of 7-Zip which functions perfectly. Update: RocketDock works on 64-bit, it is just not officially supported by the software developer. Other than these two small annoyances I did not encounter any problems. Windows Vista Ultimate 64-bit looks the same as its 32-bit counterpart and there aren't any special differences you need to get accustomed to. From a usability perspective both versions of Windows Vista are the same. The answer is "Yes!." The only downside is that you need to spend a bit of time investigating whether you have appropriate drivers for it and replacing one or two applications which don't support 64-bit. However, the benefits do make up for these small annoyances. First of all, you are no longer limited to using 3.25GB of RAM and you can install as much memory as you need. On top of that, you do get performance improvements and improved security built into the Operating System. If you migrated already to 64-bit editions of Windows Vista don't hesitate to share your experience with us. Many people will want to know how it works for you. NOTE: You cannot literally upgrade from Windows Vista 32-bit to 64-bit. You must make a clean install. I love the 64 bit version, so much so in fact, that I think of the 32 bit version as a tinker toy. The power difference is really quite amazing. I wholeheartedly agree with the author, It is most definitely worth it! I have been using Vista 64 on both mine (Ultimate, AMD Dual Core) and my wifes (Home Premium, AMD Single Core) systems for over a year and have had no major problems. Of course we had the usual teething problems with a new OS (drivers, etc...) but aside from those we really like the Vista OS. On our systems it has been a stable and solid OS. She would also like me to add that WoW runs great on a 64 bit system! I have had vista 64bit since August 2007 (1.5years) and have had very little to no trouble at all. I consider myself a very average user (email, web surfing, video editing, etc) and an avid gamer. Even my older games that I don't play anymore I installed and played without trouble. All in all I have loved my vista 64bit experience. Harddrive: Don't remember model number but raid 0 setup without any problems. I would like to point out that the driver signing prerequisite in vista 64 does NOT translate into a WHQL requirement, any valid and verified digital certificate will suffice. You should install the 64 bit version of 7-zip; it is considerably faster and has much better memory access than the 32 bit version. If you've bought or built a new PC Vista 64 certainly isn't as troublesome for drivers and the like. Vista x64 came installed on my HP Laptop. I'm guessing this is a sneaky way to introduce it to the market. As my machine was new I didnt see ANY problems with the shift. Although I notice some of my old software didnt work....! 32-bit means it can only “see” 2^32 (2 to the 32nd power) = 4GB. The computer has to be able to see the (usable)RAM + VRAM + other devices on Motherboard, etc. e.g. If you have 1GB VRAM and “other devices” takes up 0.3GB, you will only be able to use a max of 2.7GB (4 - 1 - 0.3 = 2.7) RAM. In this case, if you install 3GB RAM, you waste 0.3GB…if you install 4GB RAM you waste 1.3GB! This one's a bit technical, but it describes some of the nitty-gritty of 64-bit technology. There appears to be a shift taking place in the PC industry: the move from 32-bit to 64-bit PCs. We've been tracking the change by looking at the percentage of 64-bit PCs connecting to Windows Update, and have seen a dramatic increase in recent months. The installed base of 64-bit Windows Vista PCs, as a percentage of all Windows Vista systems, has more than tripled in the U.S. in the last three months, while worldwide adoption has more than doubled during the same period. Another view shows that 20% of new Windows Vista PCs in the U.S. connecting to Windows Update in June were 64-bit PCs, up from just 3% in March. Put more simply, usage of 64-bit Windows Vista is growing much more rapidly than 32-bit. Based on current trends, this growth will accelerate as the retail channel shifts to supplying a rapidly increasing assortment of 64-bit desktops and laptops… PC Accelerators built into Windows Vista, such as Windows SuperFetch, improve performance by keeping commonly used programs in memory, even when the program is closed. More memory capacity on 64-bit PCs allows SuperFetch to do its job more efficiently. Considering this, SuperFetch is probably the most significant feature that distinguishes Vista from all other OS's for users of all walks. Many other features won't be noticeable or even used by the common person (unless you’re a developer using WPF/WFC like in North Face Kiosks etc., or use many DX10 software). So why not take advantage of it since RAM is so cheap? For kicks, here’s a video. Consider that many workers like to have, say 20 windows open and do not shut down in order to save time in the morning (even Monday morning), they can now leave 40 windows (or more) open. Also, the more RAM they have, the more stuff can be SuperFetched and Auto Disk Defragmenter and whatever can run more efficiently in the background when AFK too. For the above scenario, workers will probably “lock” Vista with the S3 sleep more because they can resume in 5 seconds anyway, or it will just auto-sleep after a period…translating to a huge savings on energy consumption. All these are big bonuses from having a large amount of RAM (which is dirt cheap these days as well as cheaper going forward). Costs associated with driver/equipment upgrade for 64-bit compatibility may be more than made up for in productivity savings by having more RAM. A January 2009 survey by Valve Corporation indicated that of the 33.26% of gamers running Windows Vista, 24.47% run 32-bit, 8.79% run 64-bit. 64-bit is over one third of the Vista install base. ...all 64-bit versions of Microsoft operating systems currently impose a 16 TB limit on address space and allow no more than 128 GB of physical memory due to the impracticality of having 16 TB of RAM. Processes created on Windows Vista x64 Edition are allotted 8 TB in virtual memory for user processes and 8 TB for kernel processes to create a virtual memory of 16 TB. Adobe Photoshop® Extended and Acrobat® Pro natively support 64-bit editions of Windows Vista. Adobe Premiere® Pro, After Effects®, Soundbooth®, Encore®, and Adobe OnLocation™ are certified on 64-bit Windows Vista. Adobe CS4 is 64-bit only on Vista. OSX have to wait for CS5 or something like that when they catch up. What are the advantages of 64-bit computing? In early testing of 64-bit support in Photoshop for Windows®, overall performance gains ranged from 8% to 12%. Those who work with extremely large files may realize noticeably greater gains in performance, in some cases as dramatic as ten times the previous speed. This is because 64-bit applications can address larger amounts of memory and thus result in less file swapping — one of the biggest factors that can affect data processing speed. I've had my 64-bit for 6 months. I'm no computer wiz - just an over-the-hill housewife. I LOVE my 64-bit! No problems so far, and the only negitive thing I can say about it is that the new transitions for Vista in Windows Movie Maker don't run on 64-bit. I'm hoping this "problem" will be solved in WMM soon. I use Windows Vista Business x64. I never have had a problem with RocketDock. Why you say that it doesn't support Vista x64? When I bought a custom HP desktop computer directly from HP, Vista-32 wasn't even available as an option. Except for very low end models, I think places like Best Buy also only sell Vista-64 computers these days. My new HP LaserJet P2035 monochrome laser printer was designed to work with Vista-64. My previous laser printer was an ancient parallel-port-only model, so I didn't lose much. I briefly considered buying a parallel-to-USB adaptor, but never found one that was designed to work with Vista, let alone Vista-64. It sounds like those adaptors aren't particularly good anyway. I am pretty upset that Media Center doesn't cooperate in the 64 bit system. There are issues with jittery tv playback, it not recognizing the cable tv signal through the tv tuner. It's awful! I'm a big DVR girl of my fav tv shows. I did this all the time under XP and had no issues. I bought a new Vista Home Premium system that was 64 bit, had nothing but issues with Media Center ever since. Several calls to tech support later, found out that there are known issues with Media Center and Vista 64 bit. Waste of time an money for me! The rest of the computer runs great but as far as DVRing my favorite shows, I'm outta luck. If you're big into DVR via media center, till they get this fixed.... don't waste your time. I have a Lenovo/IBM Thinkpad T60, and I went from Vista 32bit Business to 64bit Ultimate. Then I found out that the memory controller on the 945GM chipset only supported 3069MB of memory even though I have 4GB, which meant no OS is ever going to see the extra gig. I cursed the heavens and Lenovo for the wasting of my time and money as my 32bit Business, although slow and bloated, didn't have any issues. But, since then I've realized 64bit is much faster when it comes to things I need. I run multiple virtual machines that makes me dip into well over a few gigs of virtual ram. When I close them, it seems to recover memory well. In the 32bit Vista and XP, I remember constantly having to reboot daily because it would always be in that constant page file mode even after I've closed all my applications because it couldn't manage memory well. Good job Microsoft. The only people bashing Vista these days are people who don't know how slick it runs these days. It was a rough ride. My first Vista experience was terrible. I ran it for 2 months when it first came out with all sorts of odd and strange problems. I went back to XP and decided it needed at least a year to mature. I also made a determination that Vista is the new Windows ME, the black sheep of all operating systems, and that in order for Vista to succeed, it will need to be rebranded. Now we'll have Windows 7, which is a rebadged, optimized and fine tuned Windows Vista. Don't let anyone tell you any different since any list of the *new features* are updates they could roll out in the next Vista service pack. I'm looking forward to it. I built a new PC about a month ago and decided to install Vista 64bit Premium edition. Everything runs fine - no problems (I did check drivers/programs, etc before install and downloaded any relevant 64bit drivers - haven't as yet had any driver/program issues). It's a big improvement over my old XP PC and I wouldn't go back to XP. As long as you have upto date hardware and software/drivers it runs like a dream. But that's not necessarily a bad thing. After my precious laptop of 3 years was destroyed (right before the warranty expired, luckily), I sent it in for repair and it ended up being more economical to exchange rather than repair. So I have this new laptop, I'm weary about making the change to vista but I installed all my programs, no problems at all. I'd been using it for a while without even realizing I was running a 64bit OS! I figured the increase in performance was because as a whole, the lappy was quite an upgrade from my 3 year old laptop. It wasn't until I finally decided that I needed to hotsync my Treo that I found out I was using the 64bit OS. I installed the Palm desktop software and noticed that it wasn't picking up the drivers. I just blamed it on "stupid vista". When I got assistance from a friend, he asked if I'd DL'd the vista or XP drivers and I wasn't sure so I checked the Palm website. Underneath OS requirements, in italics, it stated USB functionality is not compatible with 64bit vista. So I checked my system and sure enough, there was that 64bit. I almost panicked, but soon realized my new laptop has bluetooth capability and Palm was nice enough to create instructions for 64bit users on how to hotsync via bluetooth. Out of curiousness, I went over to my mother's house to test out her 32 bit Windows Vista Basic that I refused to touch becuse it was "evil". Our computer specs are close enough to each other that I figured this was a viable test and you can DEFINITELY see the performance difference. To sum up, imo Vista 64bit Home Premium > Windows XP > Vista 32 bit Home Basic. i hate the search function on it, i can have a zip file on my desktop, im looking at it, i will have windows search for it, and it tells me its not there, even though im looking at it, all the files i have on my hard drives i now cannot find, i spend most of my time searching manually for files now since this piece of crap came with the system. I hate it and prefer windows xp. Understanding Instant Search. It might be the case that it is not configured properly and this is why you have these issues. I installed Vista Business x64 about 6 months ago. The only issue I had was with VMware. I got around this by using Sun's xVM, which does the job. My view is why run 32 bit OS on a x64 machine (unless you need to run old apps/hardware), your not getting the full capabilities of what I paid for in the first place. No real problem with OS---but--- there is so much disk activity that if for no other reason I feel like going back to XP. I don't see how beating continously on the drive is any good for its long life. I have installed Vista 64-Bit Home Premium over my 32-Bit Vista and I absolutely LOVE it! First things I noticed were how fast and responsive the system was. It is very very stable. Don't overclock because that would create an unstable environment. 3) 64 bit drivers are easier to come by nowadays. 1) Can't install 16 bit software. 2) Cannot install unsigned device drivers like 3rd party IRQ changers or the system will not boot. Have to F8 to bypass. I had a very bad blue screen experience at one time however it was because my motherboard was faulty, I replaced it and I haven't seen a blue screen of death in ages. Absolutely none. will the 32 bit games work on the vista 64 bit platform? I used XP 32 and Vista 64 and truthfully after a week I completly migrated to 64 bit. Right now I am using Windows 7 and I must admit - I liked Vista but I am deeply in love in Windows 7 64bit! Let 32 bits die. 32 bits R.I.P. I upgraded to Vista 64bit and couldn't use my Canon LBP-5000 printer. Actually there aren't any Canon printers which support a 64bit OS. Shame on you Canon, as it doesn't take much to re-compile your drivers. Vista 64bit was still worth the upgrade. I run Vista 64-bit Ulimate (Greek) for more than a year on a machine with 8GB of RAM. The speed on Photoshop 64-bit on the large files I use is more than obvius but the real gain overall is the "smoothness" of my sytem when I drive it to the limits. alguem pode me dar um site ou qualquer ideia, to biz pessoal. I am quit happy with my version of Vista HP 64 bit running on an Intel Quad and 8GB of DDR3 RAM. The main problem I met is with programs that require .net framework 1.1, which is not 64-bit compatible.